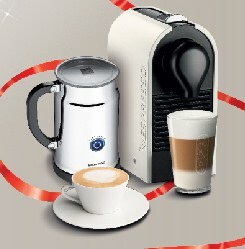 Nespresso is the brand name of Nestlé Nespresso S.A.,Lausanne, Switzerland. 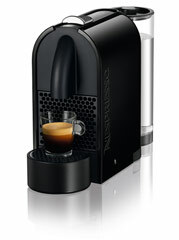 Nespresso machines brew espresso from special capsules containing ground coffee. Nespresso's story began 25 years ago with a simple but revolutionary idea - to create the perfect cup of Espresso coffee with exquisite crema, tantalising aroma and full-bodied taste - just like skilled baristas. 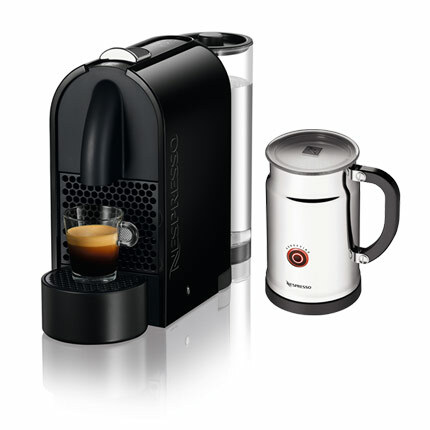 As the worldwide pioneer, Nespresso redefined the way coffee lovers around the world enjoy their Espresso coffee and their Latte through a unique combination of premium quality Grand Cru coffees, smart coffee machines and exceptional customer services. The company's story, however, is not just about one remarkable idea. Above all, it is the continuous quest for innovation and pursuit of excellence that drives Nespresso. U memorizes your preferred cup size. The machine’s brewing unit will automatically release the capsule when it’s done. The base houses the whisk storage. Maximum capacity if preparing milk froth: 4.06 oz. Maximum capacity if preparing hot milk: 8.12 oz.